Bob Kane’s famous vigilante character remains one of the most popular of all time. 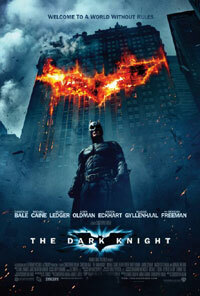 Director Christopher Nolan (and his co-writer brother Jonathan) has reinvented the Batman franchise with a vengeance. His second take on the caped crusader is as dark and adult in nature as Batman Begins. The wealthy Bruce Wayne wants to hang up his cape and sees the hope for a new, legal saviour in the shape of district attorney Harvey Dent. But the ideals of a crime-free Gotham City is crushed when The Joker holds the city to ransom, an additional villain also born as a result. The only man who can stop the madman is of course, the Batman. High-tech, slick and realistic all in one, this is top notch entertainment leaving the camp direction given the character by Joel Schumacher even further in the rear view mirror. Effectively revised by Heath Ledger as a disturbed psycho, compared to Nicholson mostly playing it for laughs in Burton's '80s version, it does have a very sad attachment, this being one of the last roles by Heath Ledger who died shortly after the film’s completion (and earned him a posthumous supporting actor Golden Globe win).